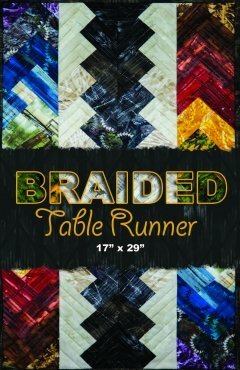 HOME > Judy Niemeyer Quiltworx > Braided Table Runner 17" x 29"
Braided Table Runner 17" x 29"
Braided Table Runner 17" x 29" - The Braided Table Runner was designed as a small, introductory project to the Braided Border unit designed by Quiltworx.com. It includes one newsprint sheet and directions with stacking and sorting graphics in color! It is designed to show off a collection of 5" squares and the cover is done is Judy’s latest fabric collection, called Reclaimed West! The Table Runner uses (2) 5" squares of each color (with (4) 5" squares being needed for two of the colors included in the collection) for a total of 52 5" squares. It is a great way to show off other 5" square pre-cut packages as well! Note: This pattern introduces a partial seams technique to sew the final units together. Additionally, options for adding sashing between the units is shown in the pattern which could increase the size marginally. These options prevent the need to worry about stacked seams when sewing the unit together. If you choose not to include the sashing, simply pin and glue the intersecting pieces before you sew, which will allow the pieces to come together properly!